Our "PP module" is a stand-alone self sufficient unit with compact footprint for small-scale zebrafish research and a durable light weight polypropylene construction. The basic model is eight rows high and holds up to 1,000 baby or 400 adult fishes. But it is possible to plan it for your specific individual needs (e.g. six rows high, smaller width ...). This unit has an automatical water exchange with fresh water supply over a programmable electrical timer and a solenoid valve. Further fresh water supply will be automatically happen if there is evaporation or other water removal - controlled over a float switch. For individual day/night cycles our "PP module" can be upgraded with roller blind and blackout shields or in combination with fluorescent lamps. We can also configurate it with conductivity and/or pH controller. 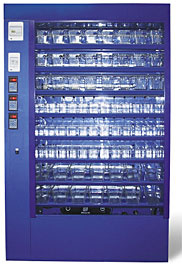 Reverse osmosis systems, fine and carbon filters are available, too. Delivery will be piped ready to connect to water supply and drain lines - no installation on our part is needed on-site.